PIERZ, Minn. — 17-year-old Jacob Fuhrman is like most teenagers, he enjoys sports, school and spending time with family. Like most teens, his busy lifestyle includes balancing homework, extracurricular activities and family time, but on top of all that, is Jacob’s condition. At a young age Jacob was diagnosed with Tourette’s Syndrome and OCD. His condition causes him to have vocal and motor tics, such as tapping, pounding on things, and shouting loud noises at random. His mother Deanna says the condition has gotten worse of the years. They started out as annoyances that could be dealt with, but have now worsened to become severe barriers that prevent Jacob from living a normal life. Over the years his parents have sought out advice from more than 20 doctors. They’ve tried more than 30 medications and therapies, but nothing seemed to work. The family continued to search for a cure until late last year when they met a team of doctors at Mayo Clinic. The team of neurologists and neurosurgeons determined Jacob’s case was one of the most severe cases of Tourette’s they had ever seen. They decided the best course of action would be a procedure known at Deep Brain Stimulation surgery, or DBS for short. The procedure has been used on patients with Parkinson’s and other conditions but hasn’t been officially FDA approved to treat Tourette’s. Because of this, Jacob’s insurance company won’t cover the procedure, putting the $98,000 price tag squarely on his family. Jacob’s mother says the money must be paid up front and doesn’t include the cost of additional appointments and other expenses. News quickly spread throughout Pierz and surrounding communities that Jacob needed their help. A GoFundMe page brought in $34,665 in less than a week. Click here to support Jacob Fuhrman's GoFundMe. 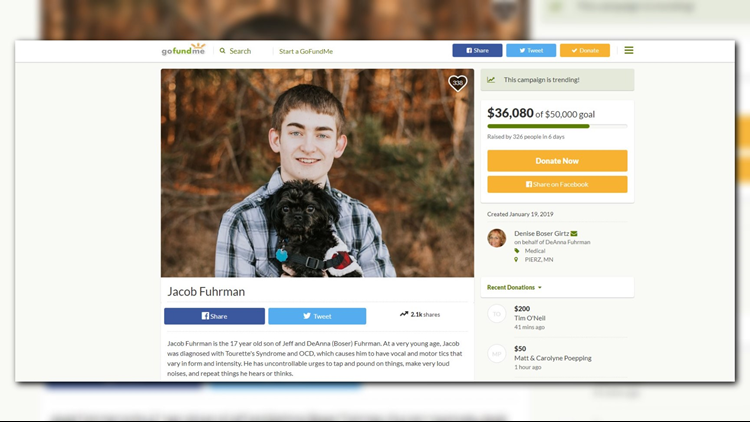 Another account at F&M Bank in Pierz is also collecting donations for Jacob’s procedure. Funds can be sent to PO Box 308, Pierz, MN 56364. The school district is also hosting a special event during Friday’s high school basketball game to raise additional money for the family.